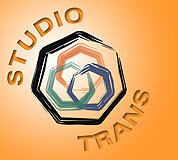 "I'm so glad we decided to go with Studio Trans' service. I've received nothing but GREAT feedback from my staff and my customers. Your service is excellent. I especially appreciate the Studio Trans team's timeliness and attention to detail when we have needed special services.."
"Where were you guys two years ago? We've spent thousands of dollars trying to get something like this developed and no-one was able to come through. This is EXACTLY what we were looking for!" "We haven't had a single problem with the orders we receive. "It's working GREAT! Our customers love it and if they're happy, I'm happy." "It's a pleasure working with you guys. You've made it very easy for us to get this project launched." "This was perhaps the easiest to use and best organized ordering experience I've had on the web (or not on the web, for that matter). Excellent job! This comment is based on 20 years in the I.T. business. Great work! I found the web site just by typing in the logical URL." "LOVE it! Don't let this ever go away! A boon to admin types who have to order lunch for the whole office crew!" "I never used your system before tonight yet I could easily do so with this system. The site is well constructed, responsive, clear and idiot proof. 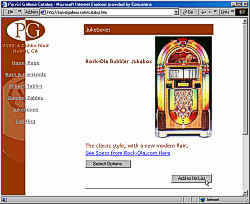 (I've been reviewing web systems for years, this one is one of the best.)" 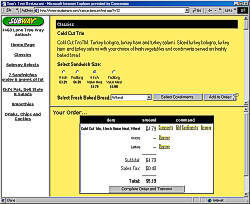 "Fabulous online ordering. THANK YOU!! I am Deaf and this is easy for me! hooorayy!" "this is the most efficient and user-friendly online ordering system *ever*. Thanks!" "What a painless way to order our office pizza bash!!" "i think every restaurant should have this system! we love it!" "ok, I've been calling for years, but this is SO MUCH EASIER! I like it alot. Well executed and clean. good job." "This is GREAT!!! We LOVE your food and now this is sooooo easy!!!" "this is SO great!! :)"
"love the idea of future deliveries!! and electronic coupons - we'll be telling others about you guys!!!" "Very easy to use. Good links. Very intuitive. Nice job." "This is the first online ordering I've ever done. I'm shocked that it's even available, let alone how easy it is. I also think the online coupons are great!" "You did a great job on your site. No frills, just quick navigation!... Awesome that you put up electronic coupons." "Best on line ordering I've tried yet... can't wait for the food to get here to see how well it works!" "This was wonderful... quick, easy, and free with online coupons ect. And the callback was fast too. Thanks for making ordering easy." "This is a lot easier than calling, you don't have to hold, due to your busy phone orders." "What a great way to order your food. I love it!" "I have used Dominos and your system is better..."
"I really like the ordering system. Not only the menu and options (hot, mild), but also the total amount spent." "I'm glad you're back online. I used to order from you through waiter.com and I like your new website better. "Very nice and easy to use system. Much better than Waiter.com I found out about your website because i guessed it one night when i was hungry and i figured you'd have online ordering. "Very snappy and easy to get to what I want. I hate to wait so I love your interface"
"A 10! If I actually get my order within the next 30 to 45 mins then I think that this is the best website in the whole entire world." * These are actual comments from users submitted after placing orders. transACTIONcart™ is an innovative and powerful new e-commerce tool that gives your Website visitors the ability to easily and enjoyably browse your full color, interactive online product catalog or restaurant menu, select and configure the items they want and with the click of a mouse button, instantly transmit orders or enquiries to your fax number or email address. ...you'll be happy to discover transACTIONcart™ does exactly that- simply, painlessly, quickly and with set up and subscription fees that are affordable for any size business- small to large. In fact, you can get transACTIONcart™ on your site, ready for your products and available to shoppers for much less than you might imagine. If your business qualifies, Studio Trans will even provide your Website hosting and Email services for FREE with your subscription. Ask your account manager for details. transACTIONcart™ integrates seamlessly with the "look and feel" of any Website on any Web server. transACTIONcart™ can easily, comfortably and intelligently accommodate thousands of menu or catalog items, organized by category. transACTIONcart DepartmentStore™ can handle many tens of thousands of catalog items, organized by department and category. transACTIONcart WineSeller™ can accommodate even the largest wine list with a search interface customized to help shoppers find wines of interest fast. With transACTIONcart™, any number of different menus or catalogs can be linked to any number of store locations. Using our automated order routing system, orders and enquiries are automatically transmitted by email or fax to the store location nearest the customer or to a main office location to be routed manually. transACTIONcart™ lets your customers easily configure any size, color and any number of additional product options that your items feature. 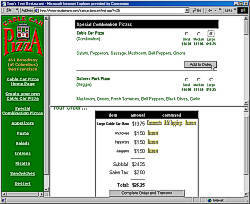 Whether it's a pizza with specially priced toppings, a sandwich with pre-selected and optional, separately priced condiments or a Porsche with all available configurations and options, our intuitive and highly interactive shopping interface makes catalog or menu browsing, item selection & configuration and order placement a breeze for your customers! transACTIONcart™ supports interactive coupons, delivery fees, minimum order amounts, and only allows order submissions during the hours you specify. Different store locations can have different hours to accept order transmissions. Different sales tax rates are also calculated based on store location. And transACTIONcart™ was designed and programmed to be totally accessible for sight impaired or blind people who need to use screen readers. Additionally, with our customization services, your transACTIONcart™ can be configured with product interfaces customized to intelligently sell your product the way your sales people would. transACTIONcart™ delivers the shopping experience your customers and prospective customers have been searching for! Every business needs new customers to prosper or even survive! Online product catalogs and restaurant menus with ordering functionality bring in new customers from the Internet and facilitates repeat business. transACTIONcart™ targets educated, affluent Internet users resulting in larger, more frequent orders and purchases. transACTIONcart™ minimizes or eliminates many problems & misunderstandings due to pronunciation & language difficulties. You can even have your menu or catalog available to online shoppers in multiple languages. transACTIONcart™ improves customer service by reducing or eliminating telephone busy signals for customers who want to place orders now. transACTIONcart™ increases employee productivity and efficiency by allowing employees to concentrate on serving in-store customers and not being distracted by ringing phones. transACTIONcart™ is like having an employee that can take orders from 100's of customers at once and never needs a day off. transACTIONcart™ adds bang to your advertising buck. By including your Web address and the words "Online Ordering" in your advertising, you'll increase the response you get from the ad. The Web is by far the most cost effective distribution medium available for your catalog or restaurant menu and coupons. The Web goes where your target market lives and works- the local neighborhood, the whole country or the world. ...of paying, month after month, for your Website to just sit there and do nothing to improve your bottom line? By enabling online customers to make purchases from your interactive product catalog or restaurant menu, transACTIONcart™ energizes your Website & finally delivers a return on your investment that you can measure.